Every couple has a restless aching, not just to know God individually but to experience God together. 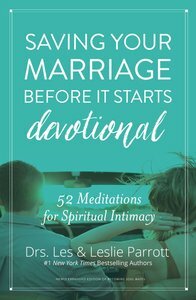 Saving Your Marriage Before It Starts Devotional gives you a road map for cultivating rich spiritual intimacy in your relationship. This book will guide you on your marriage journey to make it all God intends it to be. Start building on the closeness you've got today - and reap the rewards of a more satisfying relationship as you enjoy the intimacy of lifelong love together. About "Saving Your Marriage Before It Starts Devotional"